With the cooler (but sadly not wetter) autumn weather in place, I have been busy completing my autumn planting season (both edibles and other). Ever eager to improve on my home grown haul I am keen to maximise my harvest using all of the resources I have available (land and sunlight being the limiting ones). Unfortunately with two young pullets (who unlike their broody box reared mama) have been raised to develop a keen sense of curiosity and experimental taste buds, I have added in an extra layer of consideration when planning my planting. The first step has been to utilise my growing areas outside the yard - lane way, community planter box and a revisit my attempts a at front yard 'ornamental' cabbage bed (sadly a dismal failure last year). This has involved shifting half my brassica plantings (primarily cavalo nero and sprouting broccoli) to the outside planter boxes, not only to increase the available sunny planting area but also as a safeguard against damage inflicted by any unsupervised garden raids. The second strategy is to utilise pots strategically placed in paved sunny areas closer to the house. While out at one of the home improvement mega stores -shopping for some irrigation pegs (technically designed to hold down irrigation tubing- but they work just as well to hold down mesh to protect ground cover from foraging hens) these pink pots caught my eye. 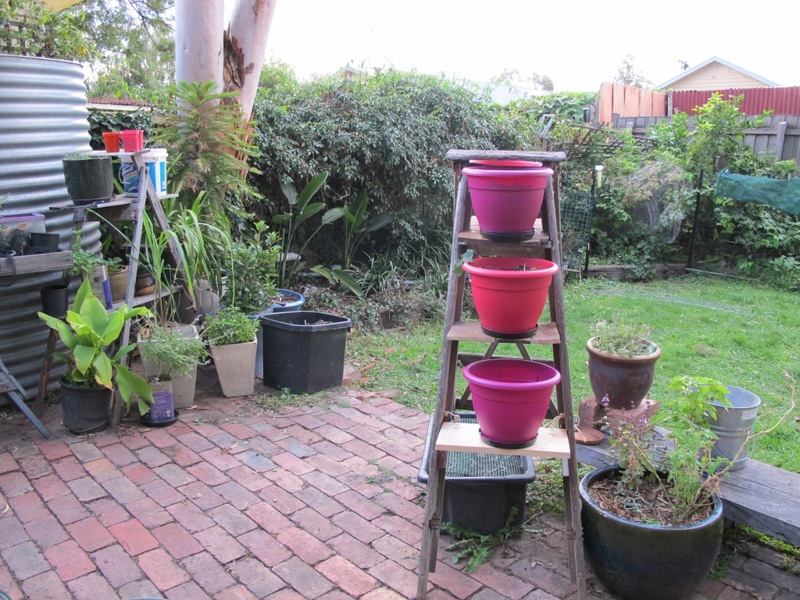 I have teamed them up with this slightly modified antique ladder from a hard waste collection to build a tiered strawberry planting (filled with runners I secured at our local produce swap). Facing the ladder on the angle allows for the eastern morning sun to reach under the ladder for a planting of snow peas and some coriander, the idea being that the ladder serves as a frame for the snow peas. Since its installation the girls have taken a serious and destructive liking to the snow peas so I am currently improving on installing removable mesh around the base of the ladder. Since the photo there have been more caging works on the recycle tub behind for some additional snow peas and a small fence around the front planter for another coriander planting. I too am having issues with free ranging hens. I have kind of fence off and area for them but as they can fly they escape, frequently.... I like your pot tower. Very stylish. Thankfully my Barnevelders can't fly very high... but the younger ones like climbing (jumping) and all of them tend to push their way through gaps in the removable fencing when they have the opportunity. They know exactly where they are going when they do.